Superficial fascia – blends with the reticular layer beneath the dermis. 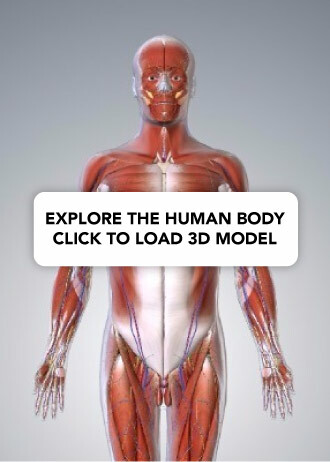 Deep fascia – envelopes muscles, bones, and neurovascular structures. Visceral fascia – provides membranous investments that suspend organs within their cavities. In this article, we shall look at the anatomy of the deep fascia of the thigh – the fascia lata. A detailed account of its structure, anatomical relations, function, attachments, and clinical relevance will be outlined. The fascia lata is a deep fascial investment of the musculature of the thigh, and is analogous to a strong, extensible, and elasticated stocking. It begins proximally around the iliac crest and inguinal ligament, and ends distal to the bony prominences of the tibia. It is continuous with what is renamed the deep fascia of the leg (also known as the crural fascia). The depth of the fascia lata varies considerably across the thigh. It is thickest along the superolateral aspect of the thigh, where it arises from the fascial condensations of gluteus maximus and medius. It is also thick around the knee where the fascia receives reinforcing fibres from tendons of the quadriceps muscles. The fascial investment is thinnest where it covers the adductor muscles of the medial thigh. The deepest aspect of the fascia lata gives rise to three intermuscular septa that attach centrally to the femur. The septa divide the thigh musculature into three compartments; anterior, medial, and lateral. The lateral intermuscular septum is the strongest of the three due to reinforcement from the iliotibial tract (see later), whereas the other two septa are proportionately weaker. 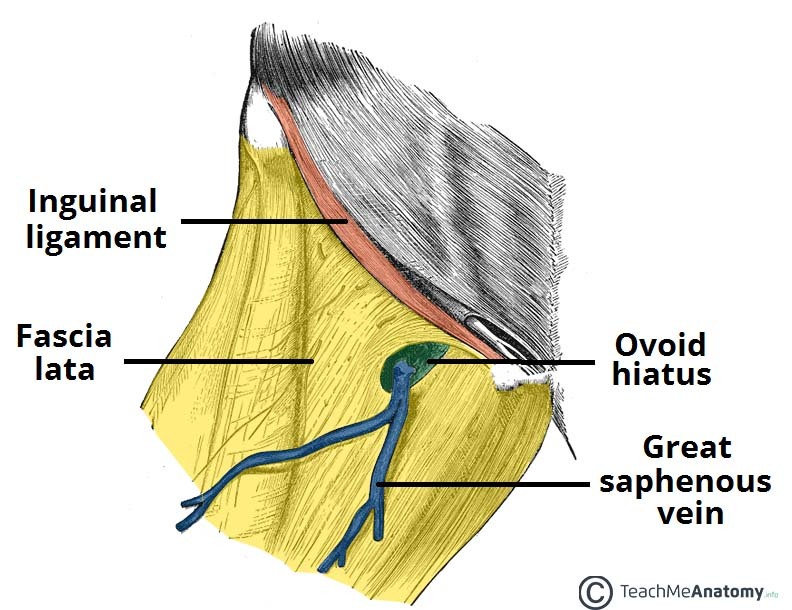 An ovoid hiatus known as the saphenous opening is present in the fascia lata just inferior to the inguinal ligament. The opening serves as an entry point for efferent lymphatic vessels and the great saphenous vein, draining into superficial inguinal lymph nodes and the femoral vein respectively. Fig 1 – The ovoid hiatus of the fascia lata. A femoral hernia develops when an out-pouching of abdominal viscera protrudes through the femoral canal. The protrusion becomes noticeable when it exits superficially through the saphenous opening within the fascia lata – producing a swelling inferior to the inguinal ligament. The saphenous opening is relatively small, and the surrounding fascia lata is quite tight and inflexible, so femoral hernias carry high risk of bowel incarceration or strangulation, which requires rapid surgical intervention. The iliotibial tract (sometimes known as the iliotibial band or IT band) is a longitudinal thickening of the fascia lata, which is strengthened superoposteriorly by fibres from the gluteus maximus. Movement – acts as an extensor, abductor and lateral rotator of the hip, with an additional role in providing lateral stabilisation to the knee joint. Compartmentalisation – the deepest aspect of ITT extends centrally to form the lateral intermuscular septum of the thigh and attaches to the femur. Muscular sheath – forms a sheath around the tensor fascia lata muscle. The tensor fascia lata is a gluteal muscle that acts as a flexor, abductor, and internal rotator of the hip. Its name, however, is derived from its additional role in tensing the fascia lata. It is innervated by the superior gluteal nerve, like gluteus medius and minimus, but is located more anterolaterally than the other gluteal muscles. The muscle originates from the iliac crest, and descends inferiorly to the superolateral thigh. At the junction of the middle and upper thirds of the thigh, it inserts into the anterior aspect of the iliotibial tract. When stimulated, the tensor fasciae lata tautens the iliotibial band and braces the knee, especially when the opposite foot is lifted. The property of TFL tightening the fascia lata is analogous to hoisting an elastic stocking up the thigh. When the fascia lata is pulled taut, it forces muscles in the anterior and posterior compartments closer to towards the femur. Contraction within each compartment centralises muscle weight and limits outward expansion, which in turn reduces the overall force required for movement at the hip joint. An additional property of tensing the fascia lata is that it makes muscle contraction more efficient in compressing deep veins, which ensures adequate venous return to the heart from the lower limbs. 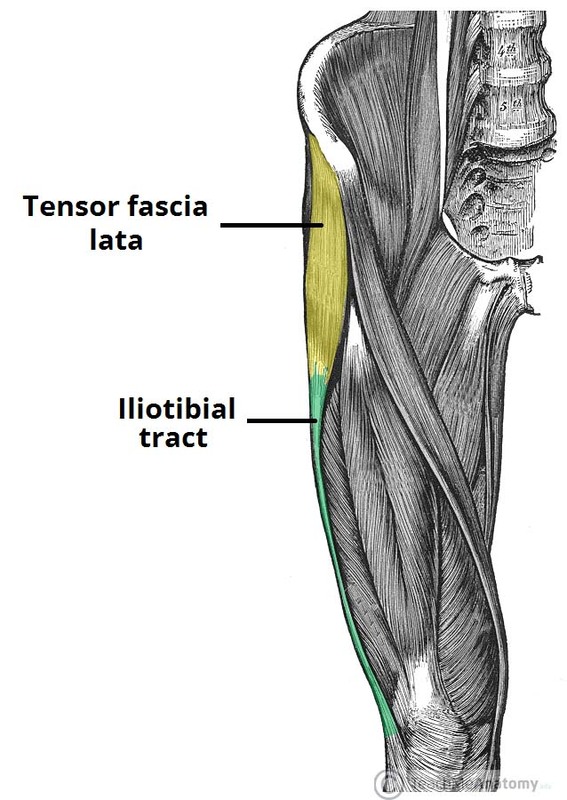 Fig 2 – The tensor fascia lata and iliotibial tract. Posterior – sacrum and coccyx. Anterior – inguinal ligament, superior pubic rami. Medial – inferior ischiopubic rami, ischial tuberosity, sacrotuberous ligament. The fascia lata is also continuous with other regions of deep and superficial fascia at its superior aspect. The deep iliac fascia descends from the thoracic region at the diaphragm, covers the entire iliacus and psoas regions, and blends with the fascia lata superiorly. The superficial fascia of the inferior abdominal wall (Scarpa’s fascia) and perineal region both blend with the fascia lata just below the inguinal ligament. The lateral thickening of fascia lata forms the iliotibial tract and receives tendon insertions superiorly from gluteus maximus and tensor fascia lata. The widened band of fibres descends the lateral thigh and attaches to the lateral tibial condyle on the anterolateral (Gerdy) tubercle. The fascia lata ends at the knee joint where it then becomes the deep fascia of the leg (the crural fascia). Attachments are made at bony prominences around the knee including the femoral and tibial condyles, patella, head of fibula and the tibial tuberosity. The deep aspect of fascia lata produces three intermuscular septa which attach centrally to the femur. The lateral septum joins to the lateral lip of the linea aspera and the medial and anterior septa attach to the medial lip. These attachments then continue along the whole length of the femur to include the supracondylar lines. Dermatofasciotomy and debridement can leave large wound sites that require post-operative grafts to facilitate tissue regeneration and healing. The fascia lata graft is a popular choice as the iliotibial tract provides a particularly high concentration of connective tissue fibres, and can be surgically harvested whilst leaving the majority of fibres intact. The main advantage of using fascia lata as opposed to an artificial product is that the native tissue is well vascularised upon transplantation, whereas the latter may require microvascular anastomosis. Which type of fascia describes the fascia lata of the lower limb? Which structure passes through the ovoid hiatus in the fascia lata of the thigh? Which intermuscular septa of the thigh is strongest due to reinforcement from the iliotibial tract?